Ok, so I know football season is still months away and basketball is almost over, but who needs an excuse to take a crack at a gourmet recipe for some delicious chicken nachos! This recipe is very simple, but plan ahead — this melt in your mouth chicken cooks in the crock pot all day long. Combine all of the ingredients in the crock pot and cook for 6-8 hours or until the chicken easily falls apart. Remove chicken from the crock pot to shred. The chicken will easily shred apart with a little help from two forks. After shredding, put the chicken back in the sauce to keep moist until you are ready to serve. 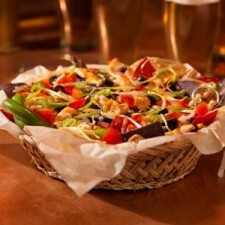 On an oven safe platter or pan lay down as many tortilla chips as you can eat. Top with chicken and shredded cheese and stick in a preheated 350 degree oven until the cheese melts. Take out of the oven and top nachos with all of the toppings you love. Try not to eat the whole plate! 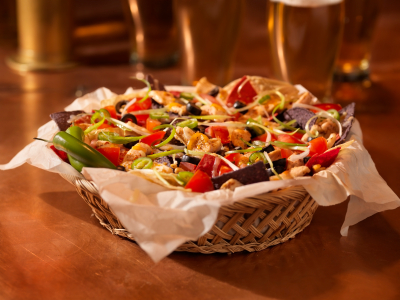 Want to know the best part of these nachos? All of the shredded chicken leftover! Use it the next day to make tacos, burritos, or use our easy recipe to serve it on top of rice.